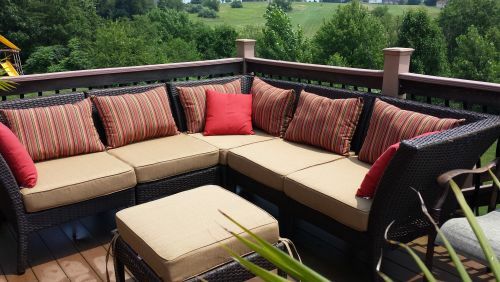 Customer Photo: Corner Deck Comfort with Custom Cushion & Pillows! Corner Deck Comfort with Custom Cushion & Pillows! New cushions designed to enhance a corner setting set. Original cushions had beveled corners and were one boring color. These new cushions allow more arrangement options and a designer look! The ottoman and seat cushions are made with Sunbrella Linen Straw (8314-0000) fabric. The lumbar pillows feature Sunbrella Dorsett Cherry (56059-0000) fabric and the throw pillows are made of Sunbrella Dupione Crimson (8051-0000) fabric.